When it comes to buying or selling a home, every little touch matters. A buyer can be put off so easily by the smallest thing, so you want to make sure that from the moment they enter your home, they are amazed. The easiest way to convey that your home is special and worth their time is to make a good first impression, and what better way to accomplish this than with a custom front door? 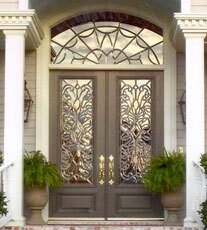 A custom door is a great way to increase a home’s perceived luxury. It adds a visual point of focus for anyone entering the home, and makes the experience of entering the house one that they will remember. Plus, people tend to associate the quality of a home with the materials they can readily see, and what is more visible when entering a house than the doorway? Having a luxury doorway is a wonderful way to build up the unique value and feel of your home without spending a fortune, and it provides a level of confidence and security about your purchase. Look up and down the street and you’ll notice something; most of the houses in your neighborhood have the same door. This is because when homes are built, nowadays they tend to be part of a pre-planned neighborhood. This means you’ll see a lot of repetition, which can make it difficult to have your home stand out above the others. In an effort to change this, consider the flair that a new door can add. Repainting your home can cost a fortune, and there’s not too terribly much you can do with your windows, so really, adding a custom made door is the best and the easiest way to show that your home is truly unique, and that the buyer should be focused on you as opposed to anywhere else. Again, your door is the first thing that a customer will see. It sets the tone for the rest of their visit, and makes them feel and think that your home is special. More than that, it sends a message that you care about your home, and that you’ve put some extra attention into its care. This will translate for any potential homebuyer into you taking care of the rest of the house in the same way. After all, if you’re going to go through the trouble of installing a custom doorway, what other wonderful and unique things are here? All of this can not only lead to the perception that your home is worth more money, but it can actually cause appraisers to raise the value of your home, too. Appraisers are people, just like anyone else. It doesn’t take much to change someone’s perception, and this goes double when you’ve had a lot of repetition. When you present something as special as a custom made doorway, it sends a strong message, and many people will carry that perception over to other repairs or add-ons that you have done. Your home is your castle, and when you’re trying to sell it, you want people to see it in the same way. You want to make a strong impression and tell people that your home is special, and what better way to accomplish this than by adding a special touch? A custom door is the easiest way to say your home is someplace that is important, and when people see it for themselves, they’ll feel important, too.